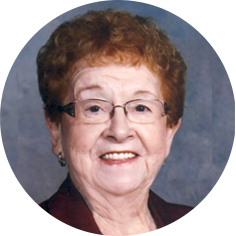 Catherine Ann Bernice Jelinski of Moose Jaw and formerly of Briercrest, SK, passed away in Moose Jaw on Sunday, November 18th, 2018 at the age of 84 years. Born in Green Bay, PEI, Bernice moved to the Claybank District in 1955 to work as a school teacher. She married Robert Bernard Jelinski in 1957, after which they farmed and raised a family in the Claybank area and developed Bob’s Insurance business in Briercrest, retiring from both in 1996. Bernice and Robert moved to Moose Jaw in 1995 where she resided ever since. She was predeceased by her sons, Gregory and Kevin; husband, Robert Bernard Jelinski, parents, Mathias and Mary Flood; sister, Stella (Peter) Funke; brother, Linus Flood; and brother-in-law, Francis Matters. Bernice is survived by her sisters: Rosaline (Leo) Condon, Inez (Jack) Duffy, Rita Matters, Evelyn (Elmer) Hagen, and Eileen (Wayne) Sharpe; and sister-in-law, Marie Flood. Bernice is also survived by her children: Dan (Kim) Jelinski of Saskatoon and their sons Greg and Josh, Ronald (Beth) Jelinski of Moose Jaw and their daughters Elyse (Garion) Carlson and Amy (Avery) Costley, Colleen (Dale) Anderson of Moose Jaw, Phil and (Jackie) Jelinski of Briercrest and daughters Kennedy and Jenna, as well as several nieces and nephews. The Funeral Mass will be celebrated on Saturday, November 24th, 2018 at 11:00 a.m. in Church of Our Lady, 566 Vaughan St, Moose Jaw, SK. Father Jake Ibay will be the presiding celebrant and interment will take place at Claybank Cemetery. A Prayer Service will be held on Friday, November 23rd, 2018 at 7:00 p.m. at Church of Our Lady. Arrangements are entrusted to Moose Jaw Funeral Home, 268 Mulberry Lane. Calvin Gammel, Funeral Director 306-693-4550. Mom and I are so sorry to hear about Aunt Bernice. We want to express our deepest condolences to all of your Family at this time. It was always very nice to see your mom when she came home. Thoughts and prayers for all of you at this time of sorrow. Our condolences & deepest sympathies to Dan, Colleen, Ron & Phil, & their families you are all in our thoughts & prayers at this sad time. Your Mom certainly was a lovely lady & will be missed by all who knew her. Dan, Colleen, Ron, Phillip and Families. I am sorry to hear of the passing of your Mother and Grandmother and my Aunt Bernice. Know that you are all in my thoughts and prayers at this time. We want to express our condolences to all our your Family for Aunt Bernice. Our thoughts and prayers for strength in the following days. Your Mom was a very sweet lady and she will be dearly missed by many. God bless you all during this difficult time. You will have to continue on her tradition of annual trips to PEI.